This morning at St. Andrew’s Anglican Church here in San Ignacio we had a three-hour Good Friday service on the seven last words of Jesus. Six church members and I, the United Methodist interloper at St. Andrew’s, gave meditations on Jesus’s seven last words, which are actually more like the seven last phrases of Jesus uttered from the cross. Contrary to what some might think, Jesus did not speak English. . . . Jesus didn’t even speak Spanish, or Kriol or even Mayan, obviously. But we can only guess exactly HOW he would have cried out those words in English. We can only guess the kind of emotion he was expressing because we can’t possibly know. We can only guess at the word or words he emphasized in that outcry to God. That’s almost an automatic reaction when we have to pain or something terribly shocking to us, isn’t it? I’ve had many of those “Why me?” moments for sure. 3. But it’s entirely possible, I think, that Jesus was steaming mad when he said those last words. “With those precious hands nailed to a tree, he couldn’t shake his fist at God–he couldn’t shake a fist at his Father, that is, but maybe he WANTED to in that agonizing moment. But that’s not to say that I didn’t get so angry or put out with the old man that I didn’t want to shake a fist at him sometimes. Which I don’t think I ever did even in our most heated moments because he might have broken my hand. He didn’t take kindly to sass from us McKay boys. I also served two full years as a chaplain in hospice care. Hospice is care given to people who are dying–people who have no chance of living more than maybe six months or six days or six hours. The Bible is full of people wracked by some kind of pain who ain’t at all happy with God. And, in fact, when Jesus said, “My God! My God! Why have you forsaken me!”–when Jesus had that moment in which he obviously felt God had abandoned even him–he was quoting from a Psalm. That line didn’t just come to Jesus’s tormented mind in the moment, but rather was a direct quote from Psalm 22, a most prophetic Lament Psalm. That’s how lament Psalms and stories end up in the Bible: we see people complaining to God, but not losing faith–they remain in CONTACT with the father because they know deep down that God is too good and trustworthy and loving to actually abandon or go cold on us. So my whole point is—it’s OK for us to be angry or frustrated or doubtful about God in EXTREME situations of pain or grief or suffering. And we will have duress in life–the rain falls on the evil and the good no matter how devout the good guys are. God is a big boy–God can take our complaints, and will hear them in a merciful and understanding way. But our forsaking–abandoning God–that’s another matter. Thank you. As I awoke sometime around half an hour past midnight and came to the computer, I after awhile had in mind to look at my emails. As I went with my mother to All Saints church here in Luton, England, yesterday to attend the service, which entailed the stations of the cross; seeing your posting has helped me be more resolute in thanking God and seeking a better relationship with my Lord and Master. Thanks again. Thank you, Peter! Hope you have a great Easter weekend! Good word! BE ENCOURAGED! BE BLESSED! Thank you, Paul. Spent Easter in bed with a virus, but lots of good reading… this post, particularly! After reading this, I became deeply troubled. 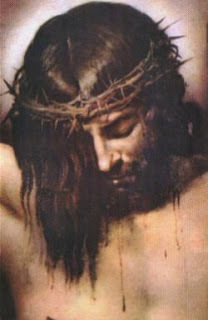 You said that Jesus cried out “My God, my God, why have you forsaken me?” in anger to God, but I do not believe that is so. These words are very important in understanding what happened to Christ on the cross. Notice how He says “My God,” and not “My Father,” Jesus had always referred to God as Father, but here it is God. Christ had cried out these words from the Psalms, not because He was angry with God, but because in those awful moments, Jesus was expressing His feelings of abandonment as God placed the sins of the world on Him – and because of that had to “turn away” from Jesus. As Jesus was feeling that weight of sin, He was experiencing separation from God for the only time in all of eternity. It was at this time that 2 Corinthians 5:21 occurred, “God made Him who had no sin to be sin for us, so that in Him we might become the righteousness of God.” Jesus became sin for us, so He felt the loneliness and abandonment that sin always produces, except that in His case, it was not His sin – it was ours. I was also troubled to hear you say it is not wrong to be angry with God. We must look at the example of Job. With everything he had gone through, everything God allowed to happen to him, he did not once curse God. Everyone around him told him to curse God. Even his wife had said “Curse God and die,” yet Job made not one accusation toward God. He cursed everything, but God he said nothing against. It is wrong to be angry at God. Anger at God is a result of an inability or unwillingness to trust God even when we do not understand what He is doing. Anger at God is essentially telling God that He has done something wrong, which He never does. Does God understand when we are angry, frustrated, or disappointed with Him? Yes, He knows our hearts and He knows how difficult and painful life in this world can be. Does that make it right to be angry with God? Absolutely not. Instead of being angry with God, we should pour out our hearts to God in prayer and then trust that He is in control and that His plan is perfect. We should not be upset with God because we are not immune to sickness and disease. The Apostle Paul said that sickness and disease are normal in this fallen world. We should not be upset at God for what our sins have done. Sickness, disease, and death are all a result of sin. Our fault not God’s. I hope I did not offend you. I also ask that you read these two articles. No offense taken, but reading the “Lament” Psalms and other verses I disagree and stand by my statement: God is a Big Boy and can take our anger–if we don’t stay STUCK in anger (which the Psalmists and Jesus himself didn’t do). That’s the caveat here. Jesus felt every emotion including anger and betrayal by his “Father,” however fleeting that moment on the cross was. Thanks for the comments.